U.S. and Afghan forces have conducted more than two-dozen joint airstrikes against opium production facilities in Afghanistan under a new campaign to target Taliban financing, the top U.S. general in the country said Monday. Army Gen. John Nicholson said the Sunday night assaults against drug labs in Afghanistan's southern Helmand province will continue in the coming days. Nicholson said the Taliban makes at least $200 million a year through opium production. The Pentagon aired videos at a press conference of the raids involving American B-52s and an F-22 bomber annihilating insurgent opium factories. Nicholson said U.S. and Afghan troops have taken out 10 of the estimated 400-to-500 drug facilities in the country. Nicholson said the strikes were "essentially" the first conducted under the new authorities issued by the Trump administration in August. The revised strategy enables military commanders to strike Taliban facilities regardless of their proximity or risk to U.S. and coalition forces. "We're hitting the Taliban where it hurts, which is their finances," Nicholson said. Afghanistan's opium has nearly doubled this year compared to 2016, according to a United Nations report released last week. 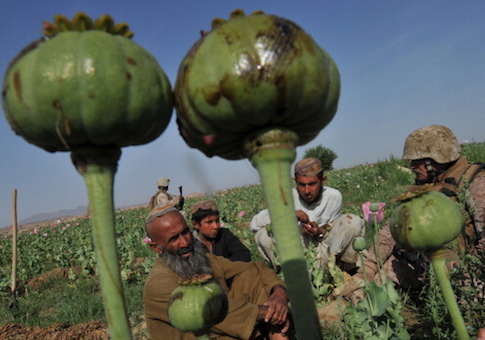 Nicholson estimated some 80 percent of the country's poppy production occurs in Taliban controlled or contested districts in Afghanistan, which represents about one-third of the country. Nicholson said the Taliban is evolving into a criminal organization, noting seven of the 13 major drug trafficking organizations in Afghanistan operate in Helmand. "They fight so that they can keep profiting from narcotics trade and other criminal activities," he said. "We will continue to apply military pressure on the battlefield." This entry was posted in National Security and tagged Afghanistan, Military, Taliban. Bookmark the permalink.